Is it time to go to the dog park, or take a puppy class? The places your new puppy is allowed to go and the other pups and people they can meet along the way is influenced, in part, by what vaccines they’ve had. So we've put together this overview of the "shots" (vaccinations) that puppies should have during their first several months of life, as well as the "why" and "when." Take a peek and discuss with your veterinarian to ensure that your new pup is as protected as they can be from the conditions that can sicken or cause them (even you) harm. Note that the vaccines listed below are marked as either "core" or "non-core." A discussion of what this means and why it's important is provided further along in this article, after the list. In some cases your puppy will already have received some of these vaccines before you pick them up. Check with the people or organization you're getting your puppy from to confirm which vaccines your pup received, and when. This information is important for your vet to have to know best how to structure your pup's initial vaccination series, as all of these puppy vaccines need to be given in a series of "initial" shots followed by "booster" shots. Combination shot protecting against Distemper, Adenovirus (Canine Infectious Hepatitis), and "Parvo." This vaccine may be administered as a DA2PP, which is the same thing, but also includes protection against Parainfluenza (an important, but “non-core” vaccine). Initial vaccine can be given at this age if necessary or desired, depending on the type of vaccine used (intra-nasal, oral, or injectable). There are two different canine flu vaccines available, each protecting against a different strain of dog flu. When needed, a dog can receive this vaccine starting at either 6 or 8 weeks of age, depending on which of the vaccines they are receiving. Either way, a booster is needed 2–4 or 3 weeks later, again depending on which vaccine they are receiving, for best protection. Go to puppy classes: If their DA2P and Bordetella vaccines have been administered by a veterinarian and your puppy isn’t showing any signs of illness, 1 week after these vaccines they can likely begin their “puppy socialization” classes. However, the facility needs to be clean, and all pups there need to have also received their first veterinary administered vaccine and deworming. Check with your vet and your puppy socialization facility of choice on timing and see this position statement on puppy socialization timing from the American Veterinary Society of Animal Behavior. Meet some (not all) other dogs: A puppy can usually also start to meet other KNOWN and healthy puppies and adult dogs at this point. Sidewalks, parks, pet stores, doggie daycare, groomers, and other areas/settings popular with other unknown dogs still need to be avoided though. Depending on your puppy's age when you first got them, this may be their first visit to your veterinarian or their second. Either way, it's an important visit. There are two different canine flu vaccines available, each protecting against a different strain of dog flu. If this is the first dose of this vaccine your pup is receiving, they will need a booster in 2–4 or 3 weeks later, depending on which vaccine they are receiving, for best protection. Start puppy classes: If a puppy hasn’t yet begun their puppy socialization classes, they can (and should) do so after receiving their vaccines during this time period. Play with known dogs: A puppy can continue to meet other KNOWN and healthy puppies and adult dogs. Avoid: Sidewalks, parks, pet stores, daycare, and other areas/settings popular with other unknown dogs should be avoided. Socialization visits: A quick “socialization visit” to the groomer should be OK, so long as the shop is kept clean and there aren’t/haven’t been any sick dogs there recently. Shopping malls and home improvement stores can be great places to socialize your puppy without excessive risk of contagious dog diseases. By now your pup's maternal immunity is likely starting to lessen and their own immune system is become more developed. Their booster shots at this visit are important to build their immunity and to help protect them from these diseases. Can receive once over 13 weeks old. State and local regulations determine the age by which all dogs must be rabies vaccinated. Initial vaccine in a 2-part series in the first year. See vaccination chart below for more detail on what this vaccine covers against and why you or your vet might want to consider it. Play with "unknown dogs": Following this visit, a puppy can usually begin to expand their circle of friends to include unknown dogs (i.e., ones you would meet on a walk), so long as they aren’t too many in number at once and they are not showing visible signs of disease and poor health. Visit more places: You should be able to walk with more ease on popular sidewalks and visit pet stores, avoiding obvious dirty/soiled areas. Longer “social visits” to the groomer should be OK, so long as the shop is kept clean and there aren’t/haven’t been any sick dogs there recently. Still avoid: Daycare centers and fields/parks (including dedicated dog parks) should still be avoided. Freedom! One (1) week after this final puppy vaccine visit, most pups have enough vaccine protection against the common vaccinatable conditions of dogs to be able to get a full groom and go to the dog park, doggie daycare, and other places where large groups of unknown dogs frequent and congregate. Of course, it's still a good idea to keep an eye out and avoid any obviously sick dogs. Puppy shots don’t last for life! When a puppy is finished with their initial “puppy shot” series, they’re not completely done with vaccines. 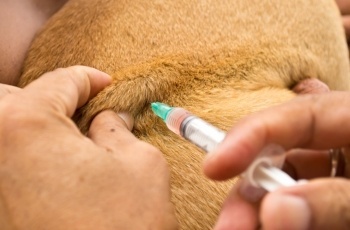 Booster vaccinations will be needed throughout your dog’s life. The frequency and types of vaccine boosters your dog will need throughout their life is influenced by their “lifestyle,” where you live and travel to with them, how common certain diseases are in your area and at different times of year, and a host of other factors. For some dogs and for some conditions, titers (blood tests measuring the level of antibodies in your dog's system) may help to determine vaccination intervals and may be preferable. This is a discussion to have with your vet. Why are "puppy shots" a series? Why is the timing important? Every puppy is different. A puppy who was one in a litter of 3 puppies may have been able to suckle more colostrum (the antibody-rich “first milk”) from Mom, than a puppy that was one in a litter of 13. Although if the Mom of the litter of 3 wasn’t well vaccinated herself, or she didn’t produce good milk or do a good job of nursing her pups, then it may not necessarily be the case. Similarly, some puppies are born with deficiencies in their immune system, or their immune system may develop more slowly because of dietary or other factors. So we never 100% know a pup’s starting immune status, how well they are initially protected by “maternal immunity,” or how well their immune system will respond to the vaccines we're administering. So to provide the best level of protection to the greatest number of puppies in the greatest number of situations, the “puppy shots” are administered as a series of "initial shots" and "booster shots" over the course of the first several months of their life. This gives their maternal immunity (which is protective but can interfere with a puppy's vaccinations) time to wane while their own immune system is fully developing in response to and conjunction with their "shots." What vaccines do dogs need? The concept of "core" versus "non-core" vaccines. "Core" vaccines: Some infectious diseases of dogs are so common, debilitating/devastating, easily spread, and/or are able to be spread to people (“zoonotic”) that their vaccination against them are deemed of critical importance for all dogs, regardless of their geographic location, “lifestyle,” etc. These include Distemper, Parvo, Canine Infectious Hepatitis, and Rabies. The vaccines protecting against these conditions are known as the “core” vaccines. As discussed above, the first three are often adminstered as the combination DA2P shot. "Non-core" vaccines: On the other hand, there are diseases/conditions for which there are vaccines, but either because of their limited geographic distribution (meaning they don't affect all parts of the country equally), lesser severity, specific “lifestyle” risk factors, or other reasons, they are not automatically always recommended for every dog. These typically include Lepto, Lyme disease, Influenza (“Dog Flu”), Kennel Cough, and Parainfluenza. The vaccines that protect against these diseases are called the “non-core” vaccines. While they’re not necessarily needed by all dogs, they can be extremely beneficial to some/many dogs and in some/many situations. Not typically recommended: Then there are the vaccines that just don’t work very well, are associated with more severe side effects, or the diseases they protect against just typically aren't severe enough to be recommended for use in general. The core vs. non-core category of each vaccine is provided in the table below for guidance, but the situation can be different for every dog and every situation. Your veterinarian is your best resource for helping to determine which vaccines your new pup would benefit from, and when. They are the only ones who have the medical training and understanding, as well as the first-hand knowledge of your dog and home/environmental situation necessary to best guide you. Not all vaccines can completely prevent infection and disease, but even if they don’t completely prevent infection, they will at least minimize the effects of infection and often shorten the course of the infection. Note that some of the vaccinatable conditions of dogs listed below can be “zoonotic,” meaning that they can also infect and cause disease in people. Usually recommended for dogs who go to kennels, grooming, day care, puppy classes, and other places where dogs often frequent. through the air or direct contact, especially when an infected dog coughs or sneezes. It can also be spread by contaminated clothing, bowls, beds, and other communal surfaces. The disease is usually mild and resolves on its own, though some outbreaks have been more severe. This virus is transmitted through ingestion, when an infected dog passes the virus in their stool and another dog eats the stool (or licks/eats the dirt or other surface contaminated with the infected stool). This virus can be transmitted through the feces, urine or vomit of an infected dog and typically gains access to a susceptible dog through contact with the eyes or nose. It can also be spread by contaminated clothing, bowls, beds, and other communal surfaces. May be recommended for dogs who go to kennels, grooming, day care, puppy classes, and other places where dogs often frequent and also for dogs in the face of a local outbreak. Based on likelihood of exposure and risk/benefit analysis. These bacteria can be contracted by drinking contaminated water or coming in contact with mud contaminated with rodent urine. the bite of an infected tick. In cases where the kidneys are affected, signs may also include sudden loss of appetite and energy, onset of vomiting, increased thirst and urinations (progressing to decreased thirst and urinations), and weight loss. Usually recommended for dogs who go to kennels, grooming, day care, puppy classes, and other places where dogs often frequent). *Parainfluenza is often included with many of the Canine “Distemper” shots (which is often a combination vaccine). This virus can be transmitted through the air, especially when an infected dog coughs or sneezes. This virus can be transmitted through the feces, vomit or saliva or an infected dog. It can also be spread by contaminated clothing, bowls, beds, and other communal surfaces. The vomiting and diarrhea are often very severe and frequent, and there is often blood in the diarrhea. This virus can be transmitted through the bite of an infected animal (raccoon, bat, other dog, etc.). The rabies shot is usually mandated by law and is typically fatal once signs are seen.